Aesthetician and cosmetic chemist Mary Schook is about to shed some light on your acne situation. 1. Your smartphone is spreading germs. The sitch: If your cell is attached to your ear at all times and you coincidentally seem to be breaking out on one side of your face or jawline, more often than not, you can place blame on your mobile device. When you touch your phone, you transfer all the germs you have on your hands onto your phone—not to mention the feces particles that landed on your phone while you were using the restroom (we all do it). 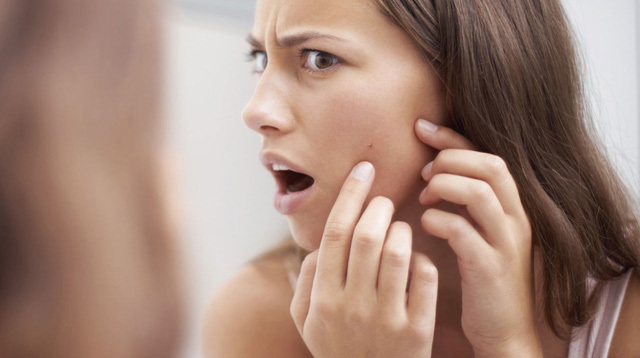 That bacteria gets into your skin, causing blemishes to brew. The fix: Religiously wipe down your cell with sanitizing wipes at the end of each day! 2. Your body is low on Vitamin D.
The sitch: When your system is low in vitamin D, it doesn't function as well and your immune system can weaken. This not only leaves you susceptible to getting sick quicker, it means bad bacteria can invade the body and show up on your skin as acne. The fix: You need to feed your body's need for vitamin D, which you can get two ways: by going outside on a sunny day (Don't forget to wear sunscreen! ), or, you can ingest vitamin D supplements. 3. You started taking probiotics. The sitch: Usually probiotics help breakouts rather than cause them, but if there is a disruption in the intestines and you take probiotics, they can stir up the bacteria in your gut and it can show up on your skin in the form of a pimple. The fix: Stick it out through the breakout period and continue taking the probiotics for a couple weeks. If you don't see a change in your skin after that, it might be time to swap out the supplements you're ingesting. Make sure the capsules contain at least eight or more strains, and then look at the number of billions (this refers to the number of colony forming units [CFUs], which can help support a positive balance of microflora in the intestines), which needs to be high also (around 30 or higher). "Our stomach acid is meant to keep bacteria from invading the body, so for the good bacteria in the probiotics to reach the colon, you need a high number of strains and billions to make it through the stomach acid," Schook explains. Also, if you have to refrigerate the probiotics, they're not going to do the job you need them to do. If they're too fragile to remain good out of the fridge, they most likely won't be able to withstand our body's high temperature either. 4. Your shower water contains metals your skin can't tolerate. The sitch: Metals in water have been known to oxidize the skin and throw off the pH levels of your skin. If the pH level of your skin is out of whack, your skin's outer layer of amino/lactic acids and oils that protect it can become compromised, exposing the skin and resulting in breakouts. Also, certain types of metals and minerals in the water can leave residue behind on your skin that can mix with sweat, dirt, bacteria, and oil—and boom, you've got another blemish. The fix: Wash your face with distilled water (it sounds annoying and high maintenance, but in order to rule out the fact that the minerals in your water aren't breaking you out, it's worth it to try for three weeks). You can also just spring for a shower filter, which will sift the minerals out of your water and hopefully leave you with a clearer complexion! 5. You're drinking too much coffee. The sitch: Coffee raises acidity, which throws off the pH balance of your body and creates inflammation on your skin in different areas (even though it shows up most commonly as pimples around your mouth). Coffee is also a soluble fiber so it can throw off the pH of the colon. The fix: Switch to drinking more water or tea, and stay away from taking in a lot of caffeine from coffee to keep the acidity levels in your body down. 6. You're not sleeping well. The sitch: Whether you're watching TV or scrolling through Instagram before bed, the light from the device simulates sunlight, causing your mind to keep you awake. The electromagnetic wave frequencies that also come off of a device like your smartphone can run through your body and can throw off your circadian rhythm (aka your internal clock), altering your sleep pattern, which weakens your immune system and stresses you out, among other things. The fix: Don't sleep with your phone thisclose to you. If you need something to do before you fall asleep, read a book (one that isn't electronic and doesn't glow) to help your mind wind down, and drink a cup of calming tea to help you pass out, so you get your full eight hours of beauty sleep. This way you keep your system working properly and your skin breakout-free. 7. You're using foundation that's too thick. The sitch: Makeup that has a thick consistency is occlusive (aka it can clog your pores and cause sweat underneath it to build up) and can attract dirt, which can sit on your skin and cause zits to crop up. The fix: If you don't need opaque coverage from your foundation, opt for a lightweight foundation. If you do wear thicker makeup because you want the coverage, then it's OK to continue to wear it, but you have to cleanse your skin more often to avoid breakouts. To do so, cleanse your skin twice: once with an oil cleanser (this will attract oil and breakdown your makeup without drying out your skin) and then wash your face again with a foam cleanser. 8. You don't use toner. The sitch: If you're already eye-rolling because you think toners are a waste of time, allow me to enlighten you: Toners actually rebalance the skin, since soaps can make your skin more alkaline (super-quick science lesson: the outside of the body should be acidic while the inside of the body should remain as close to alkaline as possible). The fix: After cleansing the skin, spray or swipe a toner over your skin with a cotton ball to bring it back to a pH level of a 5.5 acidity level. 9. You're eating too much sugar. The sitch: Consuming too much sugar, breads, and processed carbs increase the body's glycemic index, causing it to produce more oil. OD'ing on these types of foods also causes glycation, where the sugar breaks the skin cells down, which creates a domino effect, causing your collagen and elastin to weaken, and fine lines and wrinkles to appear. On top of that, the yeast in bread also creates bad bacteria in the body and if there's too much it, the effects can show up on your skin. The fix: Eat a well-balanced diet full of protein, foods rich in complex carbohydrates and fiber like quinoa, and leafy greens (these help keep your body alkaline). And drink a lot of water to stay hydrated. 10. You're switching up your beauty products too often. The sitch: If you get frustrated because your cleanser or lotion isn't living up to its claim on day two, give it some time. Swapping out products too quickly won't allow you to see if they're really effective (products need at least a good two weeks to start working). Applying too many active ingredients from all the different products can throw off the pH levels on the skin. The fix: If you're using an anti-aging product, try it out on your neck or your forehead to see if it will break you out. If it begins to burn or cause irritation, wash it off immediately. If there's no instant irritation and you don't have any pimples popping up after using it for three consecutive nights, give it a solid three weeks before you throw your hands up in the air because it isn't working. "Your skin has to adjust to the new actives you're putting on it and if it doesn't have a chance to adjust, you could end up lowering the immune system of the skin by inundating it with too many active ingredients," Schook says. If you still don't see results after a month and a half, you can try another product, but just remember to give your skin time to adjust to that one as well. 11. You're drying out your skin with acne products. The sitch: You might think that if you have oily skin, the answer is to dry it out. But when you use too many spot treatments, you can dry out the skin so much that you can ruin your skin's barrier, causing more bacteria to get into your pores. The fix: Wash your skin with a charcoal soap or use a charcoal mask to get rid of the bacteria and clear out your pores without over-drying the skin. 12. You're spreading bacteria with your facial cleansing brush. The sitch: Facial brushes are great for exfoliating, but if you have acne, you have to be careful because you could end up spreading the bacteria with the brush head from one spot to another. Plus, if you're using a brush head that's too harsh, it could cause microtears that let in more bacteria into the skin. The fix: If you're already hooked on your Clarisonic or another hand-held sonic cleansing brush, buy a few brush heads, so that you can switch them out after thoroughly washing them (they take three days to fully dry and if they're not dry, the bacteria can sometimes still be active). Then, once you have three to rotate between, use the first one on, say, Monday, wash it, pop on your second clean brush head, and allow the first one to dry for three days before you use it again on day four. Then, toss all three brush heads every three months and get new ones to keep bacteria—and breakouts—at bay. 13. You're using sunscreen that contains skin-irritating ingredients. The sitch: If you find yourself breaking out more in the summer than you do any other time of the month, it might be due to your SPF, specifically an ingredient in it called avobenzone, which has been linked to irritation and inflammation on the skin. The fix: If you're acne-prone or have super-sensitive skin, go for a formula that has physical (titanium dioxide or zinc) rather than chemical blockers to lower the risk of irritation but still protect your skin from the sun.